Football in India hopes it is at the start of a new dawn with the launch of the high-profile Indian Super League (ISL) next month, and the country hosting the Fifa U-17 World Cup in 2017. The ISL has taken three years to get off the ground, and those involved at all levels of India's football industry hope it will help loosen cricket's stranglehold on the sporting public. The new 10-week league, featuring eight clubs, kicks off in one of the world's largest untapped football markets on 12 October. Similar to the route taken by the NASL in the USA in the 1970s, the league will initially be packed with ageing stars from Europe, with reported signings including David James, Robert Pires, Allesandro del Piero, Freddie Ljungberg, Nicolas Anelka, and David Trezeguet. Among those also taking part is former Newcastle United, Sunderland, Blackpool, Cardiff, and Ipswich player Michael Chopra, whose father's family is from India. He is joining one of the most high-profile ISL franchises, the Kerala Blasters, owned by cricketing legend Sachin Tendulkar. "My main idea behind going to play in India was to have a new challenge, and I also wanted to show my support for the sport in the country," he said at the Soccerex football industry conference in Manchester. Initially, he spoke to Bengaluru FC in the existing I-League, a tournament which was created in 2007 as a means of bringing a more professional football league and organisation to the country. "I then got a call through my agent asking if I wanted to join the Super League, and of course I was very interested. 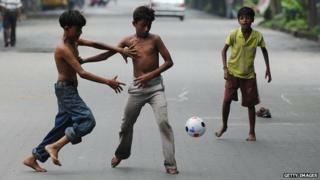 "The main thing is to boost football in India. There are 1.2 billion people in the country and not too many of them play football - cricket is still the biggest. "I want to be part of creating a football legacy in the country." A growing and increasingly affluent middle class, the regular broadcasting of Premier League and games from Spain and Italy, plus an identification of football with youth and glamour, has led the sport's administrators to hope the door is slowly opening. The All India Football Federation (AIFF), plus the I-League, are working from the grassroots up to improve all technical aspects of the game. The AIFF - after extensive talks with Fifa - is to launch a four-year strategic plan in November for the growth of the game. "I hope this plan will go a long way towards the development of professional football in India," says Kushal Das, AIFF general secretary. "It has not been easy - we have suffered from a lack of money, lack of visibility, lack of infrastructure. "Also we have not been able to develop iconic players," he adds. "The challenges have been big. But with this new [ISL] league coming up, people in India are getting interested, everyone has heard about it." Teams are based in Kolkata, Chennai, Mumbai, Delhi, Pune, Goa, Guwahati, Kochi. The launch of ISL, plus new club franchises joining the I-League, means that more money is also now coming into the sport, says Mr Das. For example, Bengaluru FC was only created in July 2013. It is owned by the Mumbai-based conglomerate JSW Group, and thanks to this backing it was crowned I-League champions in the team's first season. As well as encouraging the creation of new franchises backed by big industrial concerns, the I-League has also introduced a comprehensive licensing programme for clubs. Those not meeting criteria on things like stadium facilities, and youth development, having licences withdrawn. "Clubs now realise they have to invest in these areas, and that doing so is a benefit not a burden," says Sunando Dhar, I-League chief executive. "In coming years we will have more corporates coming into Indian football, whether they be from India or overseas." And he believes the new Super League will also have a positive effect. "The ISL was created to bring in extra attention and glamour to Indian football," says Mr Dhar. "That will have a tumble down effect into other parts of Indian football. "We are not competing with them, we are all working together to take things to the next level." However, despite a new inflow of cash into the sport, making money is not the prime goal for club owners in the I-League or the ISL, says Kushal Das, AIFF general secretary. "I have spoken to the club owners, and issues of profit and loss are not on their horizons. "They know they cannot make money in the next five years, but they also realise that the potential is so huge that they have got to forget the balance sheet for the moment, and concentrate on the development of the sport for now." The federation has high hopes for the Fifa U-17 World Cup being a tool to stimulate further growth in the game. "We will have to get the infrastructure in place for that - the stadiums and training camps," says Mr Das. "The critical thing will also be the technical side, creating a competitive Indian under-17 team that that will make the children and young people of India want to play and follow football." With signs that the ordinary Indians are also taking an interest in the sport - for example in regional cities such as Pune where there is a Liverpool FC-backed academy - this might finally be Indian football's breakthrough moment. "I do believe that football in India is a giant that has finally woken up," says Mr Das. "It is ready to get out of bed and conquer the world."